"Sampath Speaking" - the thoughts of an Insurer from Thiruvallikkeni: Usain Bolt can defy gravity too ! 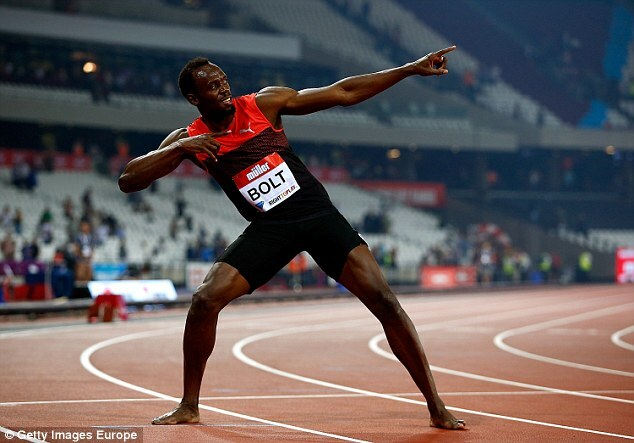 Usain Bolt, the fastest man on Universe, has defied human logic on the track and it appears he can do so too off-it. The Jamaican took to Instagram to reveal that his prowess knows no boundaries. Accomapnied with the caption: 'Anything Possible Right?' Bolt was a picture of happiness as he was posed horizontally in between a chair and a ceiling - defying gravity. Bolt has many many credits. A nine-time Olympic gold medalist, Bolt won the 100 m, 200 m and 4 × 100 m relay at three consecutive Olympic Games, although he lost the 2008 relay gold medal about nine years after due to a teammate's doping disqualification. He gained worldwide fame for his double sprint victory in world record times at the 2008 Beijing Olympics, which made him the first person to hold both records since fully automatic time became mandatory. An eleven-time World Champion, he won consecutive World Championship 100 m, 200 m and 4 × 100 metres relay gold medals from 2009 to 2015, with the exception of a 100 m false start in 2011. He is the most successful athlete of the World Championships, was the first athlete to win four World Championship titles in the 200 m and is the joint-most successful in the 100 m with three titles. Bolt improved upon his second 100 m world record of 9.69 with 9.58 seconds in 2009 – the biggest improvement since the start of electronic timing. He has twice broken the 200 metres world record, setting 19.30 in 2008 and 19.19 in 2009. His achievements as a sprinter have earned him the media nickname "Lightning Bolt", and his awards include the IAAF World Athlete of the Year, Track & Field Athlete of the Year, BBC Overseas Sports Personality of the Year (three times) and Laureus World Sportsman of the Year (four times). Bolt retired after the 2017 World Championships, when he finished third in his last solo 100 m race, opted out of the 200m, and pulled up in the 4×100m relay final. Recently, Usain Bolt made his football debut for an Australian professional, running out as a substitute for the final minutes of a pre-season friendly as he set about launching his new sporting career. 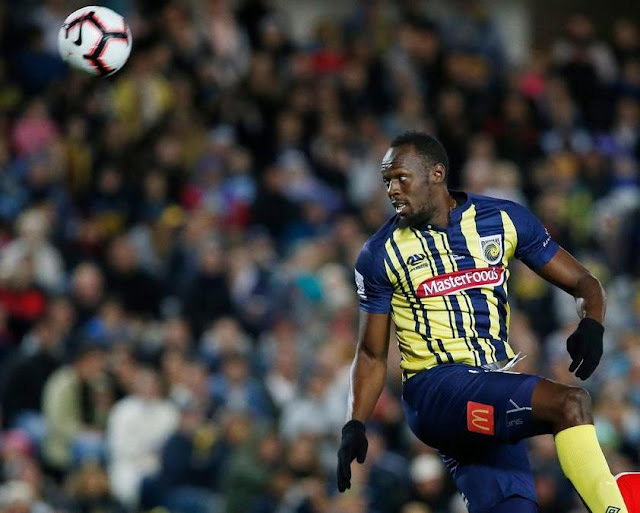 The world's fastest man was given longer than the sub 10-second bursts with which he made his name – but with only 19 minutes left on the clock he had little chance to make an impact when he appeared off the bench for the Central Coast Mariners. Almost 10,000 people turned out to watch the eight-time Olympic Gold medallist in action, higher than the club averaged for league games last season. The tall number 95 – a cheeky reference to his 100m world record of 9.58s - showed a clumsy first touch as he settled into position on the left wing but offered a hint of more to come as he twice roared into scoring positions only to fluff his lines, scuffing one shot wide and just failing to meet a dangerous cross. "I was a little bit nervous, but as soon as I got on the field I think the nerves went away," he told broadcaster Fox Sports. "I wish I had more touches, but I'm not fit yet. I've just got to put in the work and get up to speed." Bolt’s footballing ambition has frequently been dismissed as a publicity stunt but he insists his dream is realistic. 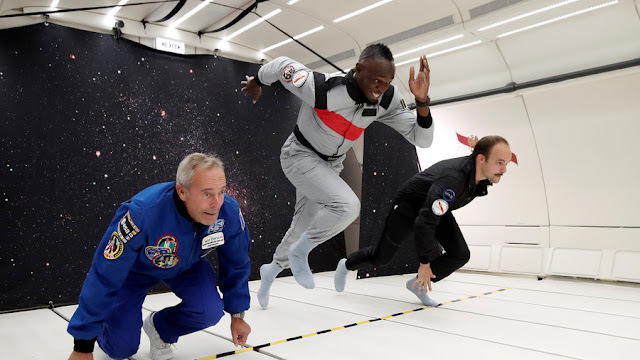 There is more ~ the world’s fastest man Usain Bolt has proved he’s just as quick without his feet on the ground, testing his sprint skills in near-weightless conditions on a special flight. The eight-time Olympic champion took a zero-gravity flight over Reims, France, as part of promotion campaign for champagne producer Mumm, which has designed a special space-adapted bottle for space tourists and astronauts. The 100m and 200m world record holder also managed to catch a hovering bubble of champagne in his mouth, demonstrating how the newly-designed Mumm bottles can be used in low-gravity conditions.